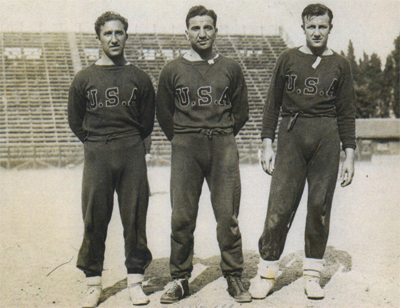 Our series on the US and the World Cup continues with a look at the US at the 1934 tournament. But where Uruguay was anxious to celebrate the one hundredth anniversary of independence from colonial rule, Benito Mussolini’s Italy was anxious to demonstrate the strength and superiority of fascism. As would become more clear at the 1936 Olympics in Berlin, international sport was becoming a venue for political propaganda. At the end of the spring season of 1933, the first ASL folded. While it was reestablished for the fall season of that year and would last until 1983, the league would never regain the level of success enjoyed by the first ASL and would be at best a semi-professional league. American soccer was entering into a dark age. Times were equally tough for the US national team. The US Football Association (USFA), as the US Soccer Federation was then called, was at best a part-time organization, as it would remain until the lead up to the US being named host of the 1994 World Cup. Its principal organizing activities, when it wasn’t in dispute with the ASL, largely revolved around running the National Challenge Cup, know known as the US Open Cup, and National Amateur Cup tournaments. More to the point, between the first World Cup in 1930 and the 1934 World Cup, there were simply no international competitions in which a US team could participate. Regional tournaments were years away. The first Pan American Games wouldn’t occur until 1937. While the Football Confederation of Central America and the Caribbean would be founded in 1938, the North American Football Confederation wasn’t founded until 1946, 15 years before the two regional governing bodies merged to form CONCACAF. Any attempts that were made to revive the short-lived series against Canada that began in 1925 (and ended the next year after only three games) have faded into history. The meager resources of the USFA precluded any possibility of the association organizing an international tour, as it had first done in 1916, three years after its founding. Indeed, that first tour came about only after the Swedish newspaper Dagens Nyheter had promised to cover any expenses over the $4000 the Sweden Football Federation had put up to finance the US tour. Other than the World Cup, the prime international soccer tournament for which the US would have been eligible was the Olympics. 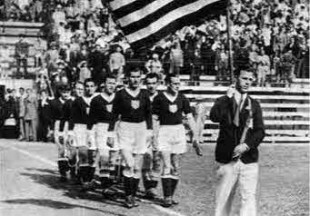 But while the US had been part of the field of nations that had participated in the soccer tournament in the 1928 Olympics in Amsterdam, no soccer was played at the 1932 Games in Los Angeles. A dispute between FIFA and the International Olympic Committee over the definition of an amateur was a prime factor in the sport’s absence from the games. Another was a simple reflection of the economic climate of the day. 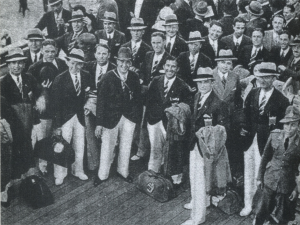 With the 1932 Olympics taking place in the depths of the Great Depression, many countries were reluctant or unable to finance the expense of sending a team to the tournament. 1930 World Cup winner Uruguay, for example, sent only one athlete to the 1932 games while World Cup finalist Argentina sent only 32. In its stead, American football would make its only Olympic appearance as a demonstration sport. The management of the 1934 US World Cup team was distinctly Philadelphian. Team manager Elmer Schroeder, who also happened to be the president of the USFA, had been born in the city and attended the University of Pennsylvania. Having managed the US team at the 1928 Olympics, Schroeder managed the Philadelphia German Americans team that won the National Amateur Cup in 1933 and 1934. He chose as the 1934 US World Cup team’s coach David Gould, the Scottish immigrant who settled in Philadelphia and had played on the John A. Manz team that won the American Cup in 1897. He later was an assistant coach at the University of Pennsylvania when Schroeder was a student there. The 1934 US World Cup squad was selected through a series of three tryout matches, with the first and third matches taking place in Philadelphia. In the first match on May 2, 1934, the US team beat the Pennsylvania League All-Stars, 8-0. Two days later in Newark, New Jersey, the US side lost 4-0 to an ASL all-star team that included the legendary Archie Stark, who had not been selected for the US team and scored a hat trick in the game. In the final match on May 5, the US beat the Eastern Pennsylvania All-Stars, 2-0.
admittedly worked on the principle that sections could not be considered that did not help defray the expenses incidental to the trip, and which would not pay the expenses of their candidates for places. It was this that probably accounts for the fact that New Jersey was passed up in the selections. This state did not raise as much revenue for the trip as other districts. It was, as Connell wrote, a “compromise” team. The squad of nineteen players included six players from Pennsylvania teams. Five came from the Philadelphia German Americans, including Peter Pietras, William Fiedler, Albert Harker, Herman Rapp and the captain of the team, Francis “Hun” Ryan, who had also played on the 1928 Olympic team. Only Pietras and Ryan would appear in the 1934 World Cup. The sixth player, Aldo “Buff” Donelli, had been born in Morgan, a town in western Pennsylvania. While attending Duquesne University, Donelli played for his college’s American football team on Saturdays and played in amateur soccer leagues on Sundays. In 1929 he was on the Heidelberg FC team that won the National Amateur Cup. Donelli was playing for the Curry Silver Tops in Pittsburgh when he received an invitation to tryout for the US team. He scored a hat trick in the first tryout game and would go on to score all of the US goals in the 1934 World Cup. Also on the 1934 squad were veterans of the 1930 team including Jimmy Gallagher (Cleveland Slavia), who had played for Philadelphia’s Fleisher Yarn in 1924-25, Thomas Florie (Pawtucket Rangers), and George Moorehouse and Billy Gonsalves (St. Louis Stix, Baer & Fuller). Two other players came from St. Louis Stix, Baer & Fuller (winners of the US Challenge Cup in 1933, 1934, and again 1935), three more from Pawtucket Rangers (runners up in 1934), and one each from the Chicago Wieboldt Wonder Bolts, Baltimore Canton, Brooklyn Celtic and the New York Americans. Just as the game of soccer had been hard hit by the Depression, so to had the United States Football Association. Because of its uncertain financial status, the USFA was late in submitting its application to compete in the 1934 World Cup. FIFA accepted the US application with the stipulation that the US would have to play a qualification game against the winner of the North American qualifying round of games, Mexico. The location of the qualification game would be in Rome at the Stadio Nazionale del Partito Nazionale Fascista, the National Stadium of the Fascist Party. One team would go home, the other would play in the World Cup. just practicing movements up in front like passing for forwards and crossovers from the outside men. It is not a real big practice because there is no defense moving and you don’t know where the heck to move and in those days we did not move like they do now. You played center forward, you would be a center forward. You had to make your opening from the defense as you could and you did not stay too far away from that one position. Donelli started the first scrimmage game the team played in Rome on the reserves side. At the half, the reserves, filled out with three Roma players, were leading the first team, 1-0. Donelli was moved to the first team for the second half and ended up scoring the winning goal. Donelli was unknown to the professional players on the team and he had the impression that they were “disdainful of the amateur from the coal fields.” Donelli said later, “There was a clique among the New York and St. Louis players and they wanted to keep me out of the lineup.” Recognizing Donelli’s undeniable talent, Billy Gonsalves, the “Babe Ruth of American Soccer,” told Schroeder he would leave the team if Donelli wasn’t on the starting roster against Mexico. When the US met Mexico on May 24 for the qualifying match, the sold out crowd included Mussolini and the American ambassador. Donelli scored the first goal at the fifteen minute mark after receiving a long pass from the back. Mexico tied the game seven minutes later. Eight minutes after that Donelli scored again to put the US up 2-1. In the second half a Mexico player was ejected for trying to pull Donelli down. With a one man advantage, the US and Donelli pressed for control of the match. In the 73rd minute Donelli had a breakaway to make the score 3-1. While Mexico managed to get a goal back, Donelli got another himself and the match ended with the US winning, 4-2. Donelli was the first person to score four goals in a World Cup game. 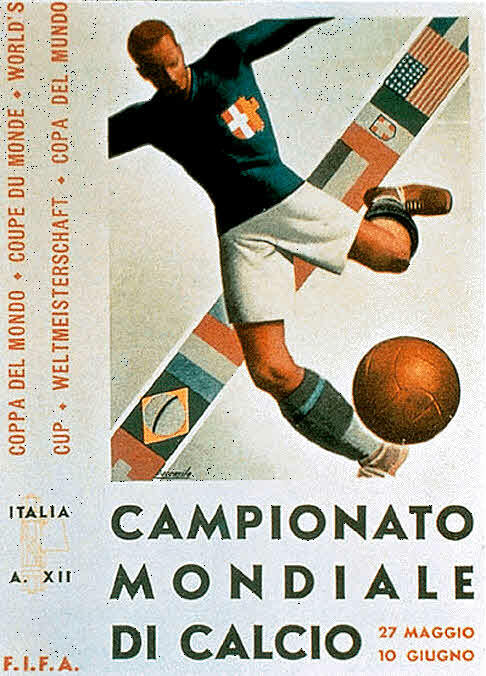 The 1934 World Cup was a single elimination tournament. Of the 32 teams that had applied to play, sixteen teams had qualified. Uruguay, host and winners of the first World Cup, declined to participate in protest of the several European countries which had declined to travel to South America. Only four of the sixteen countries that qualified — Argentina, Brazil, Argentina, Egypt, and the United States — were from outside of Europe. 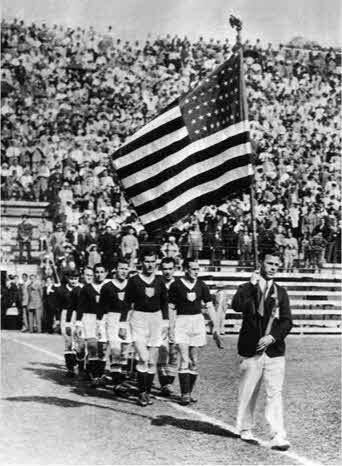 For its first match, which was officially a quarterfinal match, the US had the misfortune to draw Italy. The Italian team had been completely revamped following a 4-2 defeat to the Austrian Wunderteam only three months earlier. Taking advantage of permissive FIFA regulations, the Italian coach, Vittorio Pozzo, constructed his new squad around a core of Argentinian players — the Rimpatriato — who could claim Italian heritage. 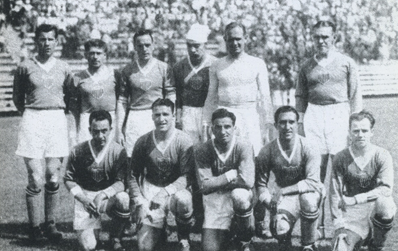 Among those on the team were Raimondo Orsi, who had scored two goals playing for Argentina against the US in the 1928 Olympics, and Luisito Monti, who had been on the 1928 Olympic and 1930 World Cup squads for Argentina. Mussolini and his son were in the sellout crowd at the Stadio Nazionale del PNF on May 27; the Italian papers made much of the fact that Mussolini had paid for his own tickets. By the time Donelli scored for the US with a shot from 20 yards out in the 57th minute, the Italians had already scored three goals, all of them coming between the 20th and 30th minute. When the match ended with Giuseppe Meazza’s goal in the 90th minute, the Italians had scored another three goals in six minutes. At the final whistle the score was 7-1 and the US was out of the World Cup. Italy would go on to win the World Cup, first beating Spain in two games after the first game was tied (and injuring at least four Spanish players along the way), next beating Austria 1-0, and then defeating Czechoslovakia in extra time in a match not without some controversy. After its exit from the World Cup, the US team embarked on a short series of games in Germany. There they defeated Wurtemberg 1-0 before playing to three 2-2 ties, one against Ulm and twice against Lower Saxony. Several US players, notably Gonsalves and Donelli, received offers to remain and play in Europe but, sensing the growing political tensions, both turned the offers down. While Gonsalves would continue to play soccer professionally, Donelli returned to American football and eventually coached the Pittsburgh Steelers and the then Cleveland Rams. Those political tensions would lead the US to refrain from entering qualification for the 1938 World Cup in Paris. The Second World War and its aftermath would put the World Cup on hold until 1950. Meanwhile, US soccer would find its self increasingly marginalized and dependent on an ethnic and immigrant fan base for its survival. A version of this article was originally published on April 15, 2010. I just found this through our author last night. Fantastic reading. Glad I didn’t miss this after the fact. These articles are great. Job well done. En la foto del equipo primero va Ed Czerchiewicz, su altura es 1.73 m, luego sigue Peter Pietras su altura 1.63 así lo encontré en wikipedia no se si esta en lo correcto o es al revés Peter Pietras, y luego Ed Czerchiewicz por favor si estoy equivocado que me corrijan o estoy en lo correcto atentamente Carlos de Perú.